Able to trace its founding dates to the 19th century, Ullstein Buchverlage describes itself as Germany’s most successful hardcover publisher. And while many houses are commercializing, Ullstein wants to be more literary. Gunnar Cynybulk is the kind of man many might like to have as their publisher. 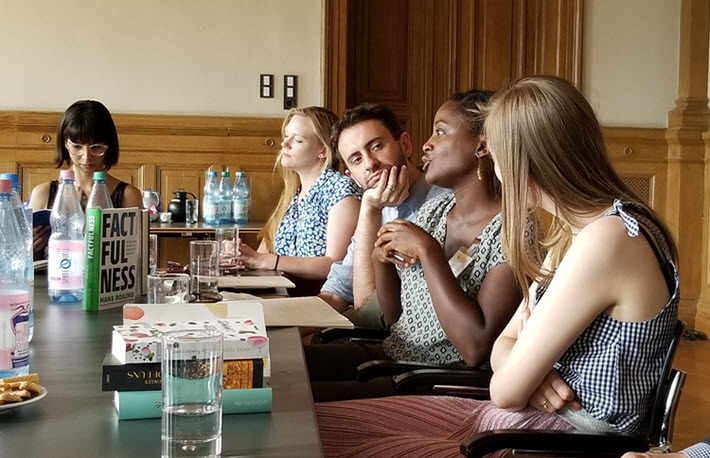 Understated and urbane, the Ullstein Buchveralge chief welcomed Frankfurter Buchmesse’s Editors’ Trip for UK and US Publishers last week to the house’s offices in Berin with grace and humor. Sounds of the company’s summer party preparations drifted up from the garden lawn several floors below. “We do books,” Cynybulk said, peering at his international visitors with a wry glint in his eye. “We try to publish popular books. Sometimes we’re wrong,” he said, pausing for laughter. “And sometimes we make the right decisions. “I was looking at my business card and found out that there are at least 11 imprints I’m in charge of. And there are some more. Ullstein is covering many, many fields and genres, popular, literary, nonfiction, paperback, mindful living, high-class classics or nonfiction books.” One of the company’s imprints, Propyläen Verlag, is going to reach is 100th year in 2019, he pointed out, an imprint for nonfiction and art history but also the home of Erich Maria Remarque’s All Quiet on the Western Front. In a country of venerable old publishing houses, Ullstein, which can trace its roots back to Leopold Ullstein’s first newspaper buy in 1877, is among the best known and biggest. Even with part of its facility under renovation, the spacious music room of the school that once occupied the site is a comfortable, airy great hall with beautifully carved ceiling panels and beams exposed to the open windows’ breezes. “What we don’t do,” Cynybulk said, “are YA and fantasy. And aside from that, we do pretty much everything. At the moment Ullstein is the most successful hardcover publisher in Germany, as far as bestseller rankings are concerned—both in fiction and nonfiction, which is great. “So what’s working? On the fiction side, it’s suspense,” Cynybulk told the editors. “Upmarket suspense, upper commercial. In Germany, we’re publishing the great household names like John e Carré, James Elroy. And Scandinavian crime, the writers who are so successful, as are Jo Nesbø and others. So thats actually the core of the Ullstein DNA. Political work at times has lain close to the Ullstein saga. Famously founded by five brothers, and originally a major power in newspapers as well as books, Ullstein’s early years are captured in Hermann Ullstein’s 1943 The House of Ullstein, a memoir written in New York after the family had fled the Nazis. The company was “Aryanized” in 1934, the Jewish family Ullstein dispossessed, the company renamed Deutscher Verlag and affiliated with the central house of the Nazi Party, the Eher-Verlag. Once returned to the Ullstein family after the war, a series of acquisitions led to sales of the books divisions, in part to Random House (2003) and the remainder to the Bonnier Group. Cynybulk took a moment to point out that Frankfurter Buchmesse’s Lars Birken-Bertsch, who led the 2018 tour to Frankfurt and Munich, as well as Berlin, had been especially effective in past years when he worked with Ullstein in marketing. “And I’m very excited,” Cynybulk said, “to acquire young talent—to accompany them to become among the classics,” a concept of author-cultivation over time that many fear is fading in as a value in Western publishing today. “International authors. We’re looking for new ones. “Publishing in Germany today is challenging.” As the visiting editors heard discussed at almost every stop, and as Publishing Perspectives has been covering, the loss of readership revealed by a GfK study has dramatically illustrated the competition that reading must wage for consumers’ time and attention in an entertainment-glutted era. Handing off to get to a meeting, Cynybulk left the rest of the visit in the hands of rights director Annemarie Blumenhagen, whose William Morris background—”I’m trained by Americans,” she quipped—makes her an adept and ingratiating communicator of the company’s position and goals. As would occur at most of the stops the tour made, usually meeting with four and five publishing houses per day, the editors heard of strong sellers, interesting breakouts, promising authors, a round robin of quick presentations of the house’s list and questions and answers with the touring editors. The German market has, effectively, a kind of trade deficit in terms of translation. Close to 14 percent of the market is work in translation, much of it from English. But only about 10 percent of German titles are selling into translation internationally, with China the leading purchaser of German licenses. 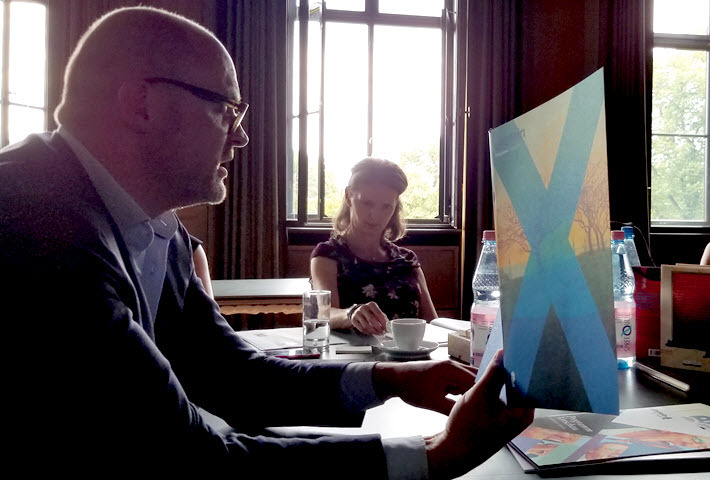 On each visit, the UK and US editors found themselves courted—albeit cordially and without sales pressure–to consider more German content for their lists. And one title in particular resonated with many in the room. 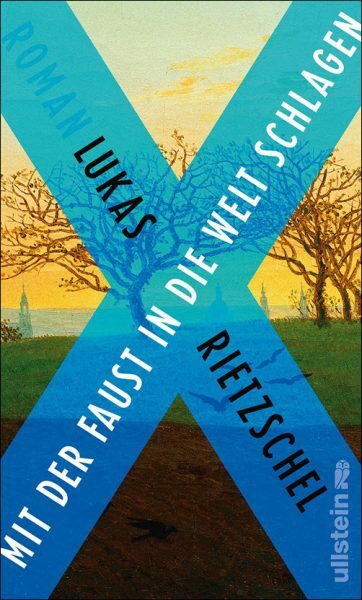 Mit der Faust in die Welt Schlagen, scheduled for a September 7 release, is a book by the 24-year-old author Lukas Reitzschel. 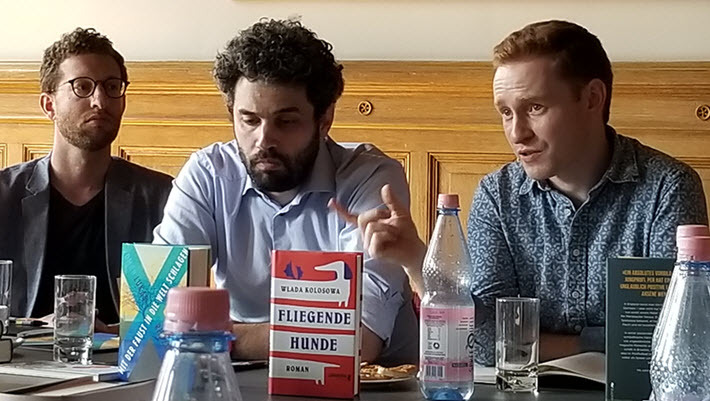 Translating roughly to Smash the World With Your Fist, the book is a novel that uses a Cain and Abel tale of two brothers in eastern Saxony to examine, as Cynybulk put it, “what went wrong in the 20 years” after German reunification. The company is announcing the book to be “a highly topical literary confrontation with our torn country,” seeming to answer that zeal Cynybulk has for deepening the company’s literary profile. It’s a book that’s easy to imagine selling into a lot of territories, and we won’t be surprised to see it in one of Publishing Perspectives’ Rights Roundups soon.